Welcome to our MUTCD regulation information site. Visitors to our site are generally looking for information about specific highway traffic regulations. 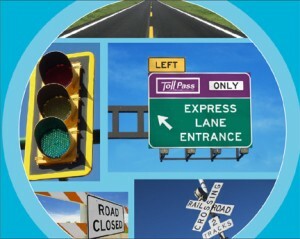 While the MUTCD standards are written to cover every aspect of road and highway safety, they are numerous and complex. Finding the specific information you need can be difficult, time-consuming and frustrating. Our goal is to create a website that describes the MUTCD regulations in a way that will be easy to find and easy to understand. MUTCD stands for the”Manual on Uniform Traffic Control Devices.” The purpose of the MUTCD is to set minimum standards for all Traffic Control Devices used on U.S. roads and highways. Traffic Control Devices (TCD) include all road signs, highway markings, electronic traffic signals, railroad crossings, and road-way construction zone areas. States must adopt the new 2009 edition by January 15, 2012. Adoption Status of the 2009 National MUTCD by States. Non-compliance of the MUTCD can result in loss of federal-aid funds and increase of liability. For more information about “What is the MUTCD?” click here. The 1900’s brought economic affluence and the automobile to America, and soon families were venturing further from home on weekend outings. Quite often, people would become lost or confused by vague or absent directional signs. Also, it generated a need for wider roads and driving etiquette. Groups organized to post signs for major roadways often overlapping with the efforts of other groups. Some heavily traveled routes could boast of almost a dozen different sign markings. Obviously, this led to confusion and demonstrated the need for a standardized sign and road marking guide which developed into the MUTCD. For a more detailed article about the MUTCD click here. The Manual on Uniform Traffic Control Devices (MUTCD) consist of 9 parts. Each part may have many chapters which describe in detail and illustration the top addressed in that part. The following is a list of 9 major parts of the MUTCD. Chapter 2I-2N – General Service Signs, etc. What are the FHWA / MUTCD Compliance Dates?